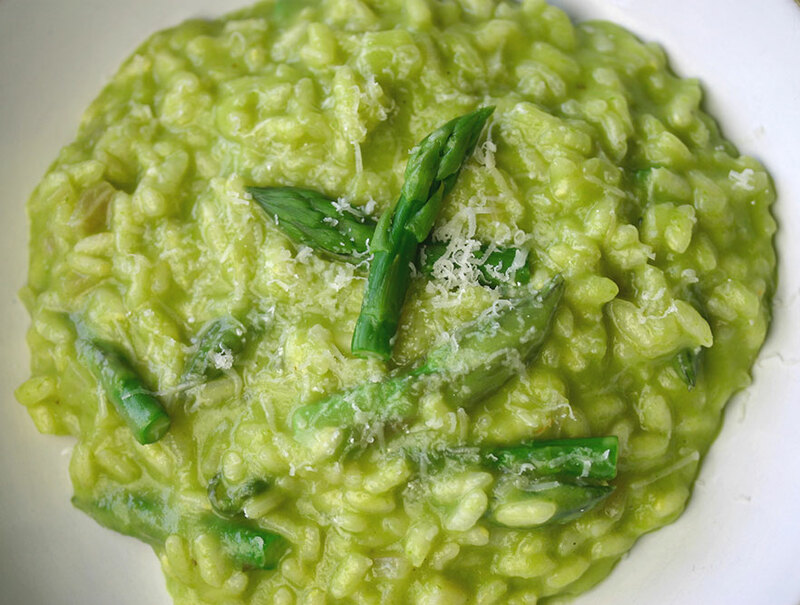 The English asparagus season is coming to an end, alas… While the last of the crop is available from our greengrocers, asparagus risotto seems a fine way to represent Italy in the Euro 2016 championships. This risotto gets its beautiful green colour by creating a purée from the stalks, which is stirred through towards the end of the cooking time. The original recipe is from the yellow River Café Cook Book 2. While risotto needs a certain amount of butter and cheese to give it that creamy silkiness, I have cut their quantities back a little bit. Heat the stock in a saucepan, and keep at a low simmer. Break the woody ends off the asparagus spears, cut off the tips and reserve, then chop the stalks into one-inch pieces. Heat the olive oil and a tablespoon of butter in a heavy saucepan over medium-low heat. Sauté the onion until soft. Add the rice, stirring to coat for a couple minutes more. Add the vermouth, and stir until it is absorbed. Add the stock – a ladle at a time – stirring until the liquid is absorbed before adding another ladleful. When the rice is just nearly soft enough, add the asparagus purée and asparagus tips. Continue to cook and stir for a couple more minutes until the rice reaches the right consistency and the risotto is heated through. Remove from the heat and stir in the remaining butter and Parmesan cheese. Season to taste and top with a grating of Parmesan. I have never tried risotto. I know shocking! This looks yummy. Love it’s color. Thanks! It’s a good one — I like the depth of asparagusy flavour (and colour) from the purée.